In last Friday’s editorial, “Early moves by Rotnofsky, Mandalapu don’t quite shake things up,” the Daily Texan editorial board wrote that new student body president Xavier Rotnofsky and vice president Rohit Mandalapu, disappointingly “just simply seem like more of the same.” Any true engagement with Rotnofsky and Mandalapu’s first few weeks in office immediately dispel this misconception. The editorial claimed that Rotnofsky and Mandalapu “pledged to shake up Student Government” simply as an extension of entering office. At no time have Rotnofsky and Mandalapu represented themselves as anything other than two students — to use their words, “very good boys” — who thought they could bring some fresh ideas to the table. Further, at their own admission, Rotnofsky and Mandalapu never thought they would actually get elected; they ran a humorous yet poignant satirical campaign in order to bring to light serious issues on campus and in SG. In doing so, Rotnofsky and Mandalapu captured the voice and spirit of campus and indeed were swept into office, not as the masquerading revolutionaries the editorial board painted them as but as two students that gained the confidence and trust of their peers against decades of precedent. The editorial was wrong about Rotnofsky and Mandalapu’s perceived failures, which were considered far too narrowly to be taken seriously. Rotnofsky and Mandalapu smartly chose not to take a stance on AR 3, the BDS (Boycott, Divestment and Sanctions) resolution. The debate devolved into hideous name-calling, character attacks and accusations of bigotry from both sides by the time it was voted on. By refraining from getting involved, Rotnofsky and Mandalapu protected their ability to serve as unifiers and representatives for the whole student body, not just one part of it. Next, Rotnofsky and Mandalapu’s picks for their executive council are not the red flag that the editorial board perceived them to be. Rotnofsky and Mandalapu took a number of factors into account when appointing the executive board. To say that the new executive board does not represent a wide range of interests solely based on a shared major is absurd. Opportunities for involvement in the new administration did not end with the executive board appointments either, as there were dozens of internal and external appointments to apply for as well. Finally, though their current platform is admittedly rather underwhelming, it will develop as student needs and campus opportunities do, as Mandalapu told the Texan when they went public with their platform. In an interview conducted with Rotnofsky over the weekend, he told me that he and Mandalapu are actively seeking to make good on the faith that students have invested in them since the election. First, Rotnofsky and Mandalapu have been invited to join the campus sexual assault task force by the Chief Compliance Officer. According to Rotnofsky, they are the first students to serve on the task force and are advocating for the appointment of a female student. Rotnofsky also said they hope to work with Not On My Campus to create a program similar to Alcohol MyEdu to educate students on sexual assaults on campus during summer orientations. Rotnofsky said they are also developing a strategy for the removal of the Jefferson Davis statue. Although the resolution to remove the statue was passed, Rotnofsky said he and Mandalapu plan to approach the issue institutionally once they make all administrative introductions. Rotnofsky said they have also met with the Division of Housing and Food Service about creating more kosher and halal options and expanding dining hours. Finally, Rotnofsky and Mandalapu have maintained the comedic flair that set them apart from the rest in the election with the recent development of a student Chili’s coupon and a comedic interview with President William Powers Jr. that is expected to go online this week. Smith is a history and humanities junior from Austin. Follow Smith on Twitter @claireseysmith. As part of their executive alliance campaign platform, President Xavier Rotnofsky and Vice President Rohit Mandalapu promised a Chili’s on campus. While there are no plans for a restaurant, the sit-down food chain is offering a coupon to UT students in honor of the Rotnofsky-Mandalapu victory. 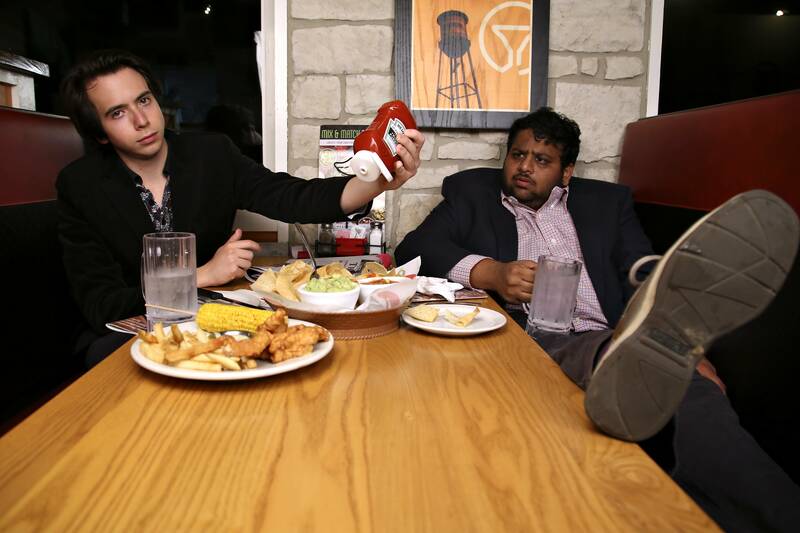 Over the course of their campaign to lead Student Government, Xavier Rotnofsky and Rohit Mandalapu had several joking goals, including renaming the West Mall the South Mall, reducing the hours the Perry-Castañeda library is open and bringing a Chili’s Grill & Bar to campus, just to name a few. A few weeks into their term, the West Mall still faces west, and the library has remained open — but when it comes to Chili’s, the duo have actually made some progress. Although Chili’s hasn’t established a restaurant at UT, the sit-down food chain is offering a coupon to UT students specifically in honor of the Rotnofsky-Mandalapu win. That’s meant to be taken literally — the coupon offers UT students free chips and salsa, guacamole or queso if they purchase an adult-sized entrée. Rotnofsky said he’s seen a lot of feedback from students about the coupon. Journalism junior Karla Martinez said she’s enjoyed seeing Chili’s’ interaction with the alliance. 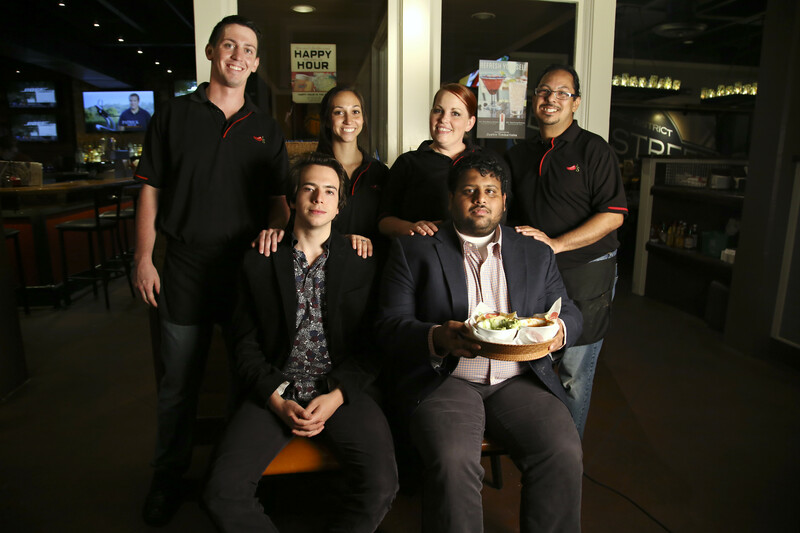 Following Rotnofsky and Mandalapu’s win, Chili’s congratulated the two on their Facebook page. Other Texas universities, including Baylor University and UT-San Antonio, have a Chili’s-to-go on their campuses. Mandalapu said there are no current plans to bring an actual Chili’s to UT. Last month, the originally satirical Xavier Rotnofsky and Rohit Mandalapu were swept into office as student body president and vice president, respectively. In doing so, they pledged to shake up Student Government and offer a much-needed respite from the “more of the same” complacent attitude that has admittedly plagued SG for many years. However, in the brief time since taking office, Rotnofsky and Mandalapu have done their best to assimilate into the unique SG atmosphere and continue many of the troubling traditions of their predecessors. This was put on full display when the new administration recently made their new staff picks. Nearly all of those selected are, like Rotnofsky and Mandalapu, students in the Plan II program. If SG was exclusive before, now it is a downright private club. And while we admire the open-mindedness in bringing on former supporters of the Jones/Dargahi ticket — Taral Patel, specifically, as chief of staff is perhaps the one smart pick — the new administration appeared to simply pluck its appointees straight from that same, predictable group of sycophants that the majority of the University’s electorate evidently dislikes about Student Government. This same appropriation of historic Student Government norms was also evident recently when the new Student Government Assembly considered A.R. 3, the contentious divestment from Israel bill that ultimately failed. Rotnofsky, who would have had the power to veto the bill should it have passed, was totally silent on the topic and offered no leadership, guidance or semblance of his own position on the controversial topic. As opponents of the asinine resolution, we would have preferred for him to oppose it, but any position would have spoken louder than his silence. The University elected Rotnofsky and Mandalapu in order to shake things up and move in a constructive new direction from the failures of previous administrations. Undoubtedly, that new direction includes being willing to take a stand on issues instead of trying to equivocate and please everyone. Rotnofsky and Mandalapu rightly chastised one of their opponents for waffling on the important campus carry issue; it is the height of hypocrisy for them to engage in the same tactics after taking office. While the new administration joked on the campaign trail about forcing out President William Powers Jr., the reality is that a new president — Gregory Fenves — will be taking the reins in just a little more than a month. Rotnofsky and Mandalapu were elected in a unique position to be a force to be reckoned with by the University administration, but only if they hold fast to their key tenet of being different. Right now, they just simply seem like more of the same. President Xavier Rotnofsky and Vice President Rohit Mandalapu intend to implement several policies centered around the needs of the student body. The Student Government president and vice president were elected on a satirical campaign, but they said their new platform is no joke. After President Xavier Rotnofsky and Vice President Rohit Mandalapu won the executive alliance runoff election in March — an election they did not necessarily expect to win — they came into office with a mostly humorous platform. Now, Rotnofsky, Mandalapu and their executive board are forming more concrete plans and ideas they said they hope to work on during their year-long term. Some of their initiatives include expanding student eating options on campus, with a focus on extending dining hall hours, adding healthier late-night food choices and increasing kosher and halal food selections. Mandalapu said they have already received some positive feedback in talking with the administration about their ideas. The team also hopes to increase civic engagement, possibly by implementing a program where resident assistants and desk monitors can become deputized as voter registrars. Rotnofsky said they also want to advocate for student issues in the legislature, including lobbying against campus carry, a bill that would allow students, faculty and staff to carry concealed handguns into campus building. Taral Patel, newly-named SG chief of staff, said the team does not want to make empty promises with their platform. Other platform points include bus route expansion, making campus more accessible for students with disabilities and increasing recycling options on the Drag and in West Campus. They also said they hope to continue platforms from the past SG administration, such as securing funds for Safe Ride, implementing on-campus tailgating and increasing branding on campus. Mandalapu said their platform is not set in stone and will likely evolve as the year continues. Rotnofsky said he plans to maintain the duo’s sense of humor while also being transparent with students. “While we will be humorous in our outreach to students, we’re also going to be completely honest with ourselves and with the students, and so, if something fails, we’ll say, ‘OK this is why this couldn’t work out,’” Rotnofsky said. Mandalapu said he and Rotnofsky hope to continue connecting with students the way they did during their campaign. Student Government President Xavier Rotnofsky and Vice President Rohit Mandalapu have selected candidates for executive board and members of the President's Student Advisory Council. According to Rotnofsky, he and Mandalapu received 105 applications and conducted over 30 hours of interviews before filling the jobs. The board and PSAC members will be appointed at an SG meeting Tuesday. Patel and Patrick served as University-wide representatives last term, while Magee was the director of the Diversity and Inclusion Agency. Stone also currently serves on the Judicial Court. Patel and Magee were both workers on the Braydon Jones-Kimia Dargahi Executive Alliance campaign. Jones and Dargahi lost to Rotnofsky and Mandalapu in a runoff. Patrick was also an agent on the Jones-Dargahi campaign. Student Government President Kori Rady and Vice President Taylor Strickland are currently halfway through their terms. Editor’s Note: With new Student Government President and Vice President Xavier Rotnofsky and Rohit Mandalapu being sworn in Tuesday evening, we thought we would take one last look at the accomplishments and failures of the outgoing administration of Kori Rady and Taylor Strickland. One year ago, the Executive Alliance team of Kori Rady and Taylor Strickland, after winning their election by a hair, came into office with big hopes toward the future. They unveiled an ambitious platform to help the average University student in a variety of ways. This included promises of a more inclusive Student Government, but it also included more specific planks. When it comes to these specific promises, the Rady/Strickland administration has a mixed record in living up to their word. For example, the Flawn Academic Center has now extended its hours to be a 24-hour space for students to study or use for other purposes. This comes on the heels of a broader promise by Rady/Strickland to extend hours in student buildings. Certainly, they — and the rest of Student Government — are to be commended for this achievement. However, it is important to note that momentum on this issue was also generated by external sources, such as a Firing Line in the Texan. The pair have also had success in expanding the Safe Ride program that prevents drunk driving by transporting students from downtown bars to their homes in West Campus or Riverside. On other issues, progress will be slower as initiatives churn through the University administration. For instance, Rady and Strickland promised an extended Thanksgiving Break, which was endorsed last semester by the Faculty Council and will likely take effect in two years. But elsewhere, progress has been almost nonexisten. Namely, during the campaign, the ticket promised to “lobby for student IDs meeting voter requirements.” Literally, the administration has done this, as the Texan reported time and again last semester. However, these exercises in lobbying don’t seem to have been particularly successful. Anyone can try and fail at a task at hand, but the students expect leaders who can actually deliver results. Be it alcohol at football games, forgiveness for first-time parking offenders or more kosher and halal eating options for students on campus, there are a number of other issues that we can find almost no progress on since Rady/Strickland took office. Obviously, it would be the height of naivete to completely fault Rady/Strickland for not being able to wave a magic wand and completely enact their admittedly sometimes far-fetched agenda. However, if an idea was not realistic to begin with, candidates have no business wooing prospective voters with its fantastic siren songs. Furthermore, much of the platform arguably was stymied by a dysfunctional and sometimes broken Student Government Assembly. Petty internal dramas ate up a considerable amount of valuable legislative time this academic year, leaving far less time for deliberating and debating pertinent issues. Additionally, even when the Assembly resigned itself from superficial squabbles and actually did its job, it was often unwilling to prioritize the big-picture issues with which Executive Alliance candidates’ platforms are replete. Alternatively, the Assembly sometimes valued insignificant and sometimes downright extraneous issues, such as recently wading into foreign policy. Serving at the helm of this University’s Student Government is not an easy task. Indeed, both recurring constraints and new challenges beset leaders year after year. Rady and Strickland have faced particularly tough constraints and still managed to accomplish plenty, but they could have done more. Hopefully, Xavier Rotnofsky and Rohit Mandalapu, who will be sworn in as Student Government president and vice president, respectively, Tuesday evening, will be able to learn from their mistakes, but also double down on the countless positive steps that the old leaders were able to fortunately take during their year in office. In the span of 11 days in the middle of February, UT rose to the forefront of one of the country’s most divisive controversies surrounding university culture. On Feb. 7, a now-infamous party took place at the Fiji house north of campus, instigating demonstrations, investigations and embarrassing headlines that spread across the world. In the month that’s followed, discussions over the role that social organizations play in UT campus life have intensified. There are still protests against Fiji, SAE is under investigation for its own possible discriminatory customs and an SG election was framed almost exclusively around whether Greek and spirit organizations wield too much power. There are obviously some very stark differences between the debate over fraternities, both at UT and nationally, and that over spirit groups at this University in particular. The former group carries connotations of misogyny and intolerance, justified or not; those same connotations are virtually nonexistent among the latter. And spirit groups at least ostensibly choose their members based on characteristics like service and leadership, while there’s a huge variation in selection criteria across different fraternities. As a case in point, it’s ironic how the particular organization Rotnofsky and Mandalapu poked at is among UT’s best at not emulating Fiji’s example when it comes to race and elitism — the Tejas Club’s most recent New Man class, to use the group’s terminology, roughly mirrored the demographics of the University overall, and the Tejas Coffee distinguished speaker series provides the UT community with access to prominent leaders in a remarkable array of different fields. Still, when every Executive Alliance this decade has featured at least one member of either Tejas or the female service group Orange Jackets (with the exception of 2012’s Thor Lund and Wills Brown, both of whom were in fraternities), it’s easy to see how this year’s Travesty duo were so successful in painting SG as a group that revolves around the interests of a select few organizations. In that regard, discussions over both Greek life and more explicitly merit-based social organizations revolve around the same central premises: exclusivity and the privileges encased therein. Within Greek organizations, those privileges often manifest themselves as extensive alumni networks, which make any selection criteria based primarily on characteristics as innate as race, class or connections inherently problematic. But even spirit groups are capable of arbitrarily and sometimes wrongly leaving intelligent and capable voices out of their ranks. That exclusivity might be necessary to maintain a group’s legitimacy as a merit-based organization, but it’s worrisome how quickly it can become insular, which is why this year’s nontraditional Student Government campaign was so effective. At the same time, outright antagonism toward exclusive groups of any affiliation strikes me as misguided. Elitism isn’t institutionalized in high school cafeterias or cubicle-adjacent water coolers, but it doesn’t take an avid fan of “Mean Girls” or “The Office” to notice that it still arises naturally. So just as UT’s musicians and top-tier athletes would find each other even without organized bands or sports teams, those attracted to Greek organizations would congregate into groups that look awfully similar to fraternities and sororities, while those attracted to service, school spirit or networking would wind up forming de facto spirit groups with their like-minded peers. Indeed, one reason Tejas and Orange Jackets have had such an influential history within Student Government is that all three institutions attract similar types of students by serving as training grounds for young leaders. That’s not a problem. That’s freedom of association. What is a problem is any organization viewing its selection process as the ultimate word on who does and does not deserve access to powerful positions or networking opportunities. In groups that select their members based on qualities other than merit, that type of exclusivity undermines the equality of opportunity for which universities are supposed to stand. And in groups that do select based on merit, it can stifle the exchange of ideas between qualified non-members and influential members. To avoid those kinds of scenarios, organizations of all stripes should promote openness and inclusivity just as strongly as they do service, leadership, friendship or any other foundational principle. That’s the strongest path toward making UT welcoming and its institutions accountable to all of its 50,000-plus students. Shenhar is a Plan II, government and economics sophomore from Westport, Connecticut. He writes about campus and education issues. Follow Shenhar on Twitter @jshenhar. Student Government Executive Alliance candidates Xavier Rotnofsky and Rohit Mandalapu filed a resolution to SG on Friday supporting the removal of the Jefferson Davis statue on campus. In its last Assembly meeting of the term, Student Government passed four resolutions, including a resolution supporting the removal of the statue of Confederate leader Jefferson Davis from campus. The issue primarily garnered attention after Mandalapu and SG President-elect Xavier Rotnofsky made the statue’s removal a platform point during their campaign. The University has never taken action regarding the statue, which has been surrounded by controversy in recent years. Rotnofsky said the statue should be removed and students should be able to pick another statue to take Jefferson Davis’ place. A nearly unanimous vote approved the resolution. The Assembly also passed resolutions in support of allowing UT System student regents to have voting privileges and in support of recognizing a Texas Indigenous Peoples’ Day. The Assembly lastly voted on a resolution in support of the Texas Dream Act, a law that would allow undocumented students to pay in-state tuition at universities. The Assembly tabled one heavily debated piece of legislation — a resolution supporting the creation of a pamphlet, which outlines many instances of racism in the University’s history. The pamphlet is not yet complete, but some Assembly members expressed concern over the content of the pamphlet, which would be distributed in each course with a cultural diversity flag. Magee said the pamphlet’s purpose should be to educate students about race issues at UT — not to boost student opinion of the University. Several Assembly members expressed concern about voting on the pamphlet before its content was finalized, prompting the Assembly to table the legislation. However, because Tuesday was the last Assembly meeting of the semester, the bill will likely be resubmitted to Assembly during the next term, instead of being sent back to committee. Current President Kori Rady’s and Vice President Taylor Strickland’s term ends April 7th, and Rotnofsky and Mandalapu will be inducted the same day. The SG 108th Assembly passed more than 35 resolutions during the 2014–2015 term.